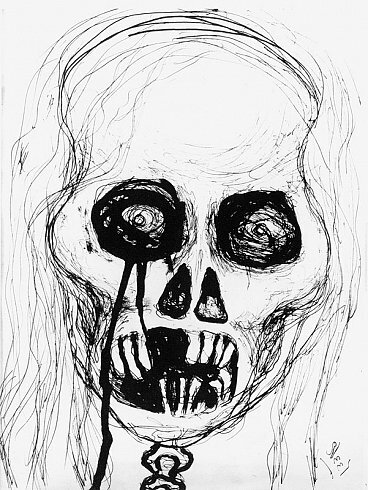 I know of at least two shows dealing with skulls or skeletons opening in the next week, and the invitation image for the Sherry Levine show at NYEHAUS is a skull too. What's up with that? I saw the show at Dinter Fine Art in the process of being installed today and it looks awesome. Well, here's one more skull inclusion currently-- Fabien Verschare's "Babe I'm on Fire" at Parker's Box. It's hit or miss, I say. I think it's the aftermath of the Alexander McQueen "skull scarfs" that cuased mass hysteria in the fashionista sect last year that's influencing the young'uns out there. Or maybe black and white is just less expensive to work with than colors. Next year will probably be mass chupacabras throughout the exhibitions. I had to go look up chupacabras to see what those are! Published on September 12, 2007 6:27 PM.